Antalis produces new Satimat swatch. Antalis UK has produced a new Satimat swatch. The purpose is to showcase the benefits of this triple coated silk paper and board. 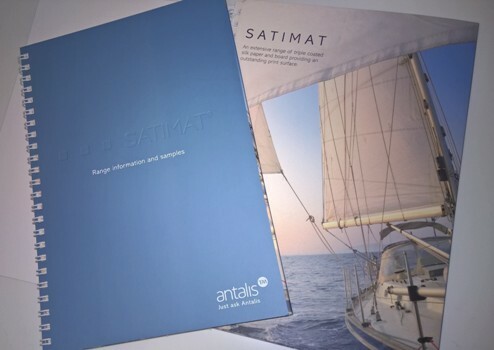 Exclusive to Antalis, Satimat is a woodfree silk coated paper, offering a special texture to all printed communications requiring a sense of refinement. Antalis said the exceptional velvet touch of this chlorine free, triple coated silk finish paper and board with its high whiteness, smooth even surface and high opacity gives excellent print results. Satimat is marketed as combining legibility with excellent image contrast and allows for solid ink coverage whilst providing a very short drying time, alongside some impressive green credentials including FSC certification, ISO 9001, ISO 14011 and OHSAS 18001. The new swatch features printed samples, technical specifications and range chart. Satimat is available from 90gsm to 450gsm in SRA2, SRA1, B2, and B1 sizes.